At Lil’ NoNo’s, it’s always 11:59pm. The cozy bar is set in a gutted warehouse build, overlooking a cityscape. You’re either there because you’re lonely or looking for trouble–there are no other reasons. Either way, there’s jazz, free drinks (and pay-for ones), cigarettes, and nooks and crannies to explore. The music isn’t bad, either. Take the elevator next to the bar down to the cellar. There’s a long hallway set up with posters and invites. You know what they lead to–other virtual parcels, yet they’re mostly set up to not hinder your experience of what Lil’ NoNo’s imitates. There’s locked doors you can’t enter, and ones that lead to a small coffee shop and a washateria. They’re probably there for private conversations or a change of scenery for regulars, secrets and favorites for the patrons. On the corner is a convenience store with lucky boards, souvenirs, and snacks, and a street scene where there’s either snow or rain, depending on the current season. 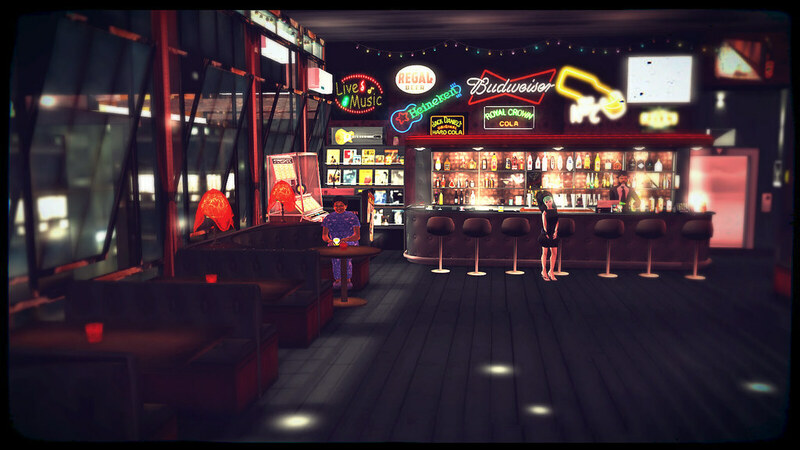 And behind the stage of the bar itself where you can’t see, a game room, looking out onto another lonely backdrop of large, ominous buildings. Places like these make visiting Second Life worthwhile, because of the thought and care put into building them. Aside from some rl branding I spotted in the bar and a mesh figure from a video game, I love this place to death. You can often catch me here nursing a drink. Do me a favor. Buy me a gin on the rocks if you see me, and see if they have some Johnnie Taylor on the jukebox. I’ll tell you a fun secret if you do that.